The Alcohol and Drug Counselor Exam (ADC) is an important credential for anyone working in addiction services. The exam is produced by the International Certification and Reciprocity Consortium (IC&RC) and its member boards and administered by Iso-Quality Testing, Inc. The exam’s 150 multiple-choice questions seek to identify whether you have sufficient knowledge and skills to respond appropriately to situations that counselors currently encounter in their practices. You will need to contact your local IC&RC member board regarding eligibility requirements and registration fees. Each board has its own unique requirements and procedures. The ADC is administered as a computer-based exam at local testing centers. Test dates are set for each testing center as needed. After meeting eligibility requirements and registering through your local member board, you’ll be notified by e-mail with detailed information about your exam date, time, and location. You will need to bring a valid, government issued photo ID and your candidate admission letter to the testing center. Before the exam, you will receive a brief tutorial. The exam is followed by a brief survey. An on-line demonstration of the exam format is available here. You may cancel or reschedule your exam up to five days before the scheduled exam date by logging on at the Iso-Quality Testing website. This will incur a fee. Under certain specific circumstances (e.g., jury duty, death in the family, military deployment) you may reschedule or cancel an exam within the five-day window without being charged a fee. If you fail to show up for an exam, or arrive to an exam without the proper identification or candidate admission letter, you will not be permitted to take the exam and your exam fees will be forfeited. If you have a disability or religious obligation that makes a modification in exam administration necessary, you may request specific changes, in writing, to your IC&RC member board before scheduling an exam. Your score is based on the total number of correct answers. There is no penalty for incorrect answers, so be sure to answer every question and make a guess if you’re not sure of the answer. You’ll receive your preliminary score immediately following the exam and your official score through your local member board approximately two to three weeks after the exam. Exams are scored on a scale ranging from 200-800 with a minimum score of 500 required to pass. You will receive a letter with your official scaled score and the percentage of items answered correctly in each content domain. If you wish to retake the exam, you must wait a minimum of 90 days from the initial test date. 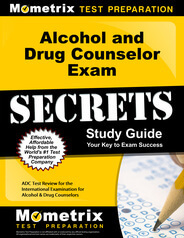 Prepare with our Alcohol and Drug Counselor Study Guide and Practice Questions. Print or eBook. Guaranteed to raise your score. Get started today! All questions are multiple choice, with three or four responses. To receive credit for a correct response, you must choose the answer that reflects the best option of those provided. The exam consists of 125 scored questions and 25 pretest or pilot questions. The pretest questions appear randomly throughout the exam. You will be given three hours to complete the exam. Use of cell phones or other electronic devices is prohibited. Interpreting and summarizing screening and assessment results. Evaluating, discussing, and documenting treatment progress, outcomes, and multiple pathways of recovery. Alcohol and Drug Counselor Flashcards. 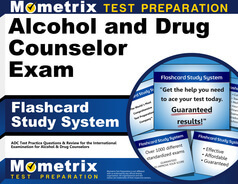 Proven Alcohol and Drug Counselor test flashcards raise your score on the Alcohol and Drug Counselor test. Guaranteed. Understanding and communicating about the disease of addiction and related health and psychosocial consequences. Maintaining client’s privacy and confidentiality in preparing and handling records, and ensuring reports and records are concise, clinically accurate, and objective. The experts at Mometrix Test Preparation are here to help make sure you are prepared to pass the ADC. The ADC Exam Secrets Study Guide and ADC Flashcards together provide essential information to help you succeed. These tools will not only provide valuable test-taking strategies, but also help you master the material covered in the four domains and learn how to apply that knowledge to achieve a passing score. Explore our free Alochol and Drug Counselor review provided by Mometrix. Check out our premium Alochol and Drug Counselor study guide to take your studying to the next level. If you benefit from these materials, just click the link below! To compliment our Alochol and Drug Counselor book, we also offer extensive flashcards for even more Alochol and Drug Counselor test prep help. We hope you enjoy our products! Your purchase helps us make more great, free content for test-takers just like yourself.